Proactively manage your hotel reputation with our smart solutions to earn more positive reviews and manage negative feedback. Plus, track your competitors to set goals and achieve results. Put a reputation strategy in place at your property to help more travelers choose your hotel. Improve occupancy and increase revenue by taking control of your reputation. Simply hoping that happy guests will leave reviews is no longer enough. We help hotels get more reviews with better ratings through post-stay reputation engagement and strategic tracking. Post-stay emails encourage happy guests to leave a positive review and prompt unhappy guests to provide private feedback. Increase your ranking with better reviews and improve guest experience. You’ll have happier guests and encourage positive future reviews. Set strategic goals with our advanced competitor tracking. You’ll know exactly how many more reviews you need to move up. Rank higher on review websites, earn more reservations, and improve ADR by proactively managing your hotel reputation. When comparing two hotels at the same price, 60% of travelers will choose the hotel with a higher review score. of travelers say that reviews are important when deciding where to stay. of travelers would pay more for a hotel with a higher review score. of travelers usually or always reference TripAdvisor reviews when deciding where to stay. The power of positive reviews has been the biggest reason that we’ve been able to double our revenue in less than 5 years. If you have a property that’s doing most everything right but can’t fill your rooms I highly recommend this program. It’s simple to integrate into your daily operation and the results are phenomenal! The ROI is the best I’ve seen in 25 years with everything else a distant second. If it was not for Reputation Management, I would still be at the bottom of the list in hotel reputation. Reputation Management has helped improve my hotel reputation and has increased my business. Customers who would have never considered staying at my hotel are now booking online and calling me directly to book. Read about how we helped Croc’s Resort & Casino make quick improvements to their online reputation. They experienced a 2-spot TripAdvisor city rank increase in just 20 days and a 131% increase in Google reviews. Every Reputation Management customer receives complimentary access to TMG OneView™, our guest feedback management system. Access all of your hotel reviews from popular review websites, OTAs, and social media anytime, anywhere, and from any device. Read reviews, write responses, and share to social media all from one place. 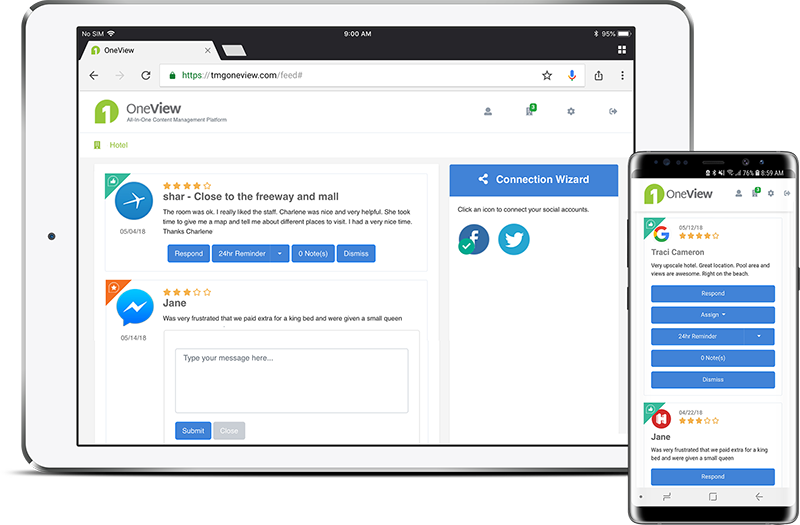 Engage with guests and never miss another review with TMG OneView™. Take charge of improving your reputation online. Complete the form below to request a demo of our reputation management solutions.